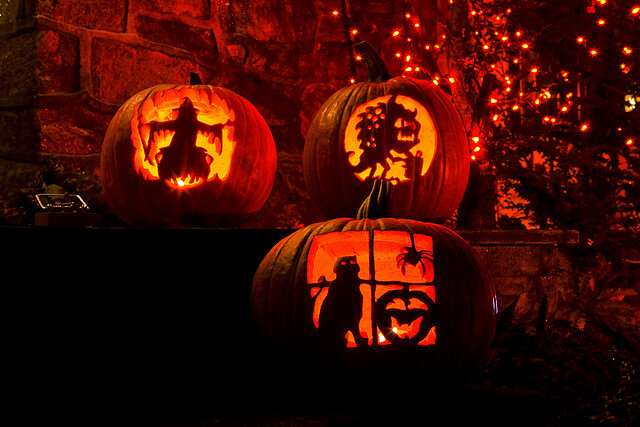 Trick or Treating, Costume Parties, Haunted Walks! 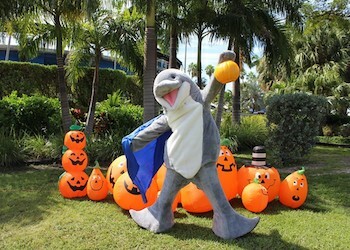 There will be tons of fun for young and old with our classic attractions for the little ones whether it's trick or treating with the animals at Zoo Miami, hay riding and the pumpkin patches at Little Farm, or making a splash at the Seaquarium. 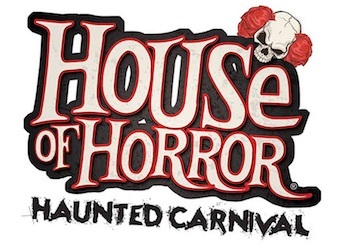 For teens and adults, House of Horrors returns at Miami International Mall with more horrifying, heart-pounding adventures and Zoo Miami adults only open bar Monster Masquerade takes place earlier in the month. What? : Pedal boats, tractor rides, race karts, pony rides, playground, bounce house, scarecrow forest, hay maze, and petting zoo. Hours: Saturdays and Sundays from 10:30 a.m. to 5:30 p.m. What? 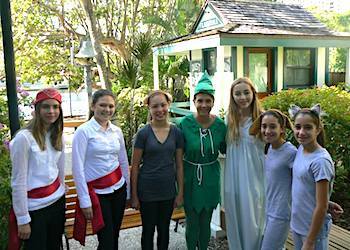 : Join Peter Pan, Wendy, Captain Hook and the Lost Boys for a magical adventure along the shore of the New River. Perfect for boys and girls, the Peter Pan Pirate Party combines the renowned literary characters with food, games and fun. Hours: From 11 a.m. to 12:30 p.m. It's pumpkins and palm trees! We might not have the crisp temperatures but yes, we can also have our own fun in the fall. 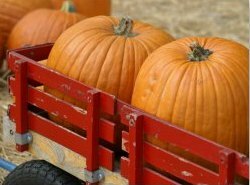 Coconut Grove puts on a fun-filled weekend for the family, together with scarecrows, cornstalk and haybale mazes, hillbilly hay rides, and of course pumpkin galore! Lots of activities for the kids, a Pumpkin Food Court Feast, thrilling carnival rides, bounce houses, a Pumpkin Beer Garden for mom and dad and of course your favorite fair foods! How Much? General Admission $20, (2 years old and up) includes all carnival rides, shows and activities except pumpkin and decorating purchases which are available for an extra fee. What? 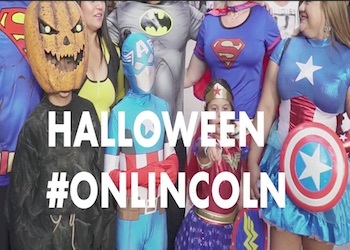 : A cavalcade of costumed revelers celebrating on October 31st as families, friends, ghosts and goblins of all ages converge in Lincoln Road as it transforms into the most outrageous catwalk in town filled with plenty of treats for all. What? 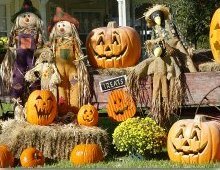 : For kids 12 and under, costume contest, trick-or-treating, halloween crafts, music and games, fun prizes and the most fun part of all? 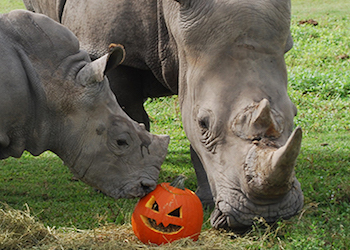 The animals also get to enjoy their Halloween treats. How Much? : Included with park entrance, Adults $22.95, Children (3-12) $18.95. All prices plus tax. 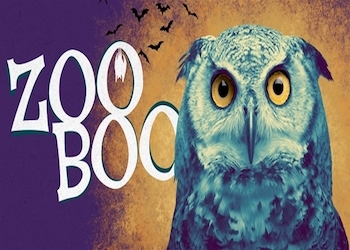 More info and times for animal treats events: Zoo Boo and follow their FB Page for latest updates. What? 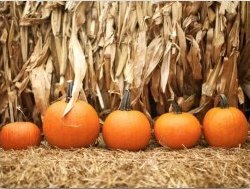 : A picture perfect Pumpkin Patch, Create a Scarecrow Zone, Flipper's Dance Party plus face painting, inflatables, rides, and much more! How Much? 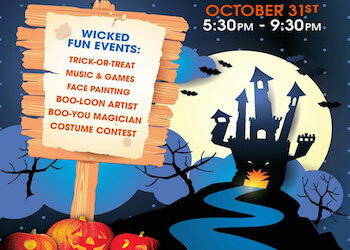 : Halloween Events are FREE with Regular park admission Adult $46.99 and children (3-9) $36.99 All prices plus tax. Groupon Limited Time Offer Adult $28, Child (3-9) $22. More info: Miami Seaquarium Monster Splash or follow their FB Page for latest updates. What? : 2018 program TBA. 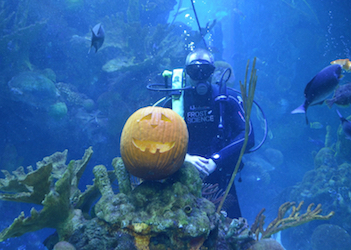 Last year: Super chilling dry ice and liquid nitrogen "magic", underwater pumpkin carving, understanding sharks, bird encounters, do-it-yourself chemistry and much more. Come in costume and receive a complimentary Halloween "mini-button" for getting into the spirit. How Much? : Free with museum admission. What? 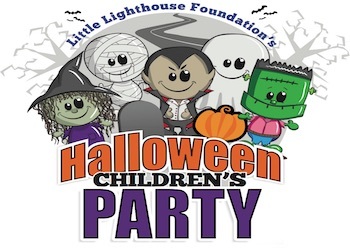 : Brought to you by The Little Lighthouse Foundation, this fantastic Halloween bash includes trick-or-treating along an established route within the Park with treat stations managed by Little Lighthouse Foundation volunteers. Children finish the afternoon inside the Nightmare on the Beach Village for a fun Halloween party featuring interactive games, face painting and a costume contest! Wear your coolest costume and enter the contest!!! What? 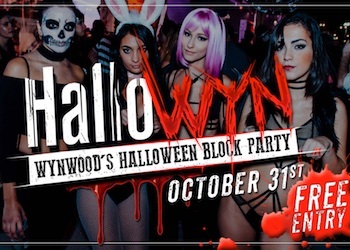 : Miami's hautest and hottest model hosted Halloween warehouse party, a luxurious all-inclusive spooky costume party celebration, featuring an open bar, DJs, VIP and model lounges, appetizers and desserts, and live entertainment at Macaya Gallery in Midtown. 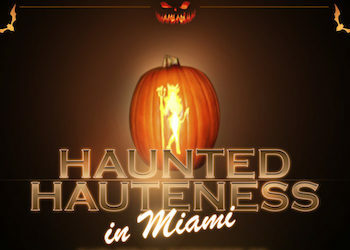 The First Annual Haunted Hauteness Halloween Bash aims to raise funds benefiting the non-profit Miami Model Citizens' Thanksgiving Food Drive. There are two preview events on September 8 and October 9, these rooftop cocktail mixer/fundraisers will take place at the 1 Hotel South Beach. More info and tickets: Haunted Hauteness Halloween Bash. What? 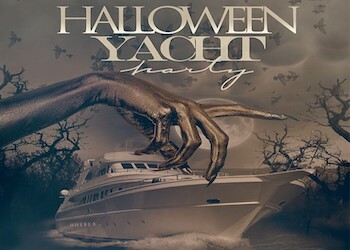 : Come party this Halloween at this multimillion dollar 125' luxury yacht leaving from Downtown Miami. The South Beach Lady provides climate control on all decks that maximize the comfort in all areas of the yacht, plus a partially covered fourth deck. Cash bars are available on every deck, and the bow of the vessel is complete with furnishings to enjoy seating and partying outdoors. Four levels, VIP Areas, eight flat-screen TVs, open-air promenade, new cabana-style furniture and a DJ sky booth... Music will be provided by DJ Snap and DJ Prince. Your ticket includes a complimentary light buffet, and costumes are mandatory! 21+ only. What? : On its third year, Wynwood Fear Factory will host once again some of the biggest names in the music industry. This year's line up include Galantis, RL Grime, Duke Dumont, and many others... What's more, they put on an eerie showcase of haunted attractions to keep all fans on edge... scare zones, haunted entertainment and performers, and of course food. 18 and older, VIP 21+. How Much? : $80 - $140 Early Bird General Admission include standard entry to the festival, 21+ bars and numerous food trucks, merchandise booths, art installations, ground view of stage, as well as access to all haunted attractions and the rest of the Wynwood Fear Factory world of Halloween! What? 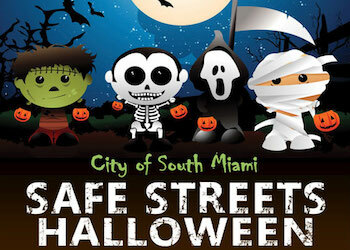 : Thousands of Miami's most eclectic souls dressed in outrageous costumes will be at the largest "FREE" block party in Miami. Live art, music and entertainment, an artisan market, costume contests, 20+ of the top Wynwood food trucks and a number of fully stocked bars. What? 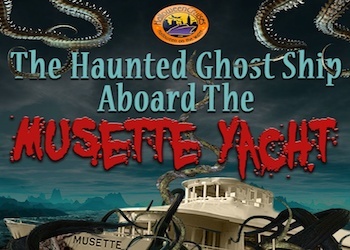 : Spend a frightful night of fun with dancing and drinks for purchase at the Haunted Ghost Ship aboard the Musette Yacht in Miami! The yacht was built for top-of-the-line entertainment, with a 400-guest capacity and three climate-controlled decks. The DJ plays Top 40, pop, hip-hop and much more to keep the party rolling. Wear your best Halloween costume with a group of ghastly ghosts and goblins for a scary great time. 21+. What? : Humongous 2-acre, 30-room haunted house, amusement park with carnival rides and games, circus attractions, interactive experience of illusions at Scare X Studios and for those 21 and over, "The Underground Bar". Some more highlights: TWO brand new haunted houses, BLOSSOM LN and AREA 13. 1455 Asylum, Gates of Phobia, Hellzapoppin, Freak Emporium, and of course Carnival rides, live performances and eats! What? : Put down the pumpkin spice and pick up your dousing rods! 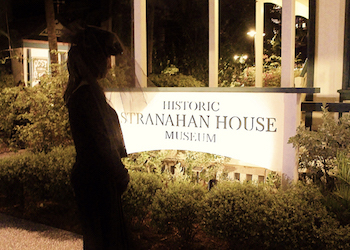 Listed as one of South Florida's must-see Halloween events year after year, the annual Spirits of Stranahan House Halloween Tours are guided by authentic Victorian Mourners and will divulge the dark secrets of the spirits who linger within the confines of the Stranahan House. Additionally, the Grave Keeper will tell tales of countless other haunted sites throughout Florida. You may even come across the spirit of Frank Stranahan himself! What? 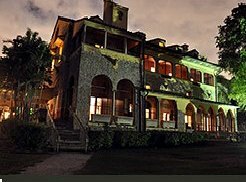 : In partnership with the League of Paranormal Investigators, the Deering Estate at Cutler, Miami's most haunted house, offers a couple of ghost tours, including the "Deering Estate Spookover" and the "Be Your Own Investigator" experiences. Tours may contain mature subject matter. When? : Historic Ghost Tours - September 28, 29, October 3, 24, 2018 8:00 p.m. to 10:00 p.m.